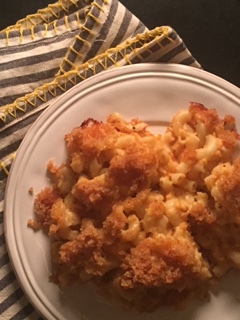 Mac n’ Cheese is synonymous with comfort food. The “blue boxed” variety has become a mainstay in many pantries. My own father even prefers it! YUCK! Hi Dad 🙂 My grandma’s mac n’ cheese is the best! 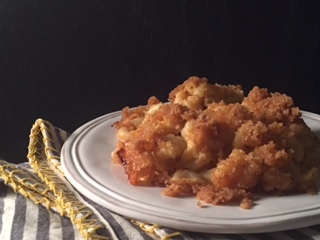 With it’s creamy cheesy roux and buttery bread crumb topping, it tastes like love in a baking dish! There is a hilarious family story surrounding this dish too! My grandparents had a neighbor who was elderly and on a fixed income. She used to get assistance in the form of food, which in those days, I believe was called commodities. When she had surplus, she would often share it with her friends. One of the things she shared with my grandma was the cheese. It was regular cheddar cheese but was pale in color. It used to upset my grandpa when my grandma would use “the government cheese”. In fact, he spent more than one meal complaining about the government cheese ruining his macaroni! My grandma was a practical woman and likely told him to pipe down, that there was no difference! But, grandpa could tell, because it was pale yellow not the rich golden color he was used to. 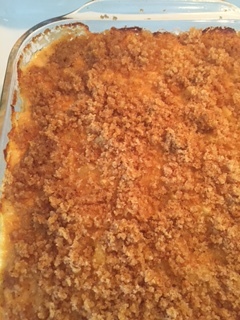 The next time we had mac n’ cheese, it was the familiar orangey gold and my grandpa went on and on about how much better it tasted and how he’d never eat that pale macaroni again! We all ate our dinners and enjoyed the wonderful food, reaching for just one more piece of that beautiful crunchy edge until we had our fill. The mac n’ cheese was NOT the best part of that meal, however. The best part for me came when we were clearing the table and with grandpa safely back in his chair, grandma pulled a small bottle of food coloring out of the pocket of her bib apron. She had a sneaky smile and held one finger to her mouth in the universal sign for “Sssshhhhh”. That was a special moment, both because we shared a secret and because she showed me that sometimes you gotta do what you gotta do! Thanks for that, grandma. I sure do miss you. 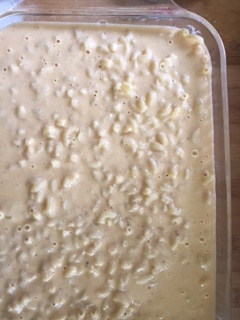 Cook and drain macaroni, pour into a greased 9×13 baking dish. 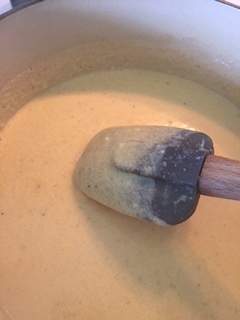 In a large saucepan, melt butter add flour and spices and blend. Continue to cook until golden. Add milk and stir constantly until mixture starts to thicken. Stir shredded cheese into sauce until smooth. Combine bread crumbs, paprika and melted butter and sprinkle over the top of he pasta. 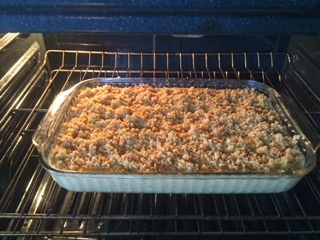 Bake in a 350 degree oven 55-65 minutes or until edges are brown and bubbling. Hahaha, I thought that was my family you were writing about. The government cheese you mentioned was exactly the same as Velveeta! Came in a big foiled block. Made great gooey grilled cheese sandwiches. We always added a drop or three of yellow food coloring, in Giblet gravy for Thanksgiving or Christmas, or chicken & dumplings. My mother’s theory was that if it had a rich golden color it would look better, therefore taste better.